Designed for safety and added support while getting in and out, or transferring to and from bed. The base of the rail installs between the mattress and box spring and is secured with a heavy duty adjustable strap which runs completely around the box spring and snaps into a buckle. Strap length will accommodate up to a queen sized bed. 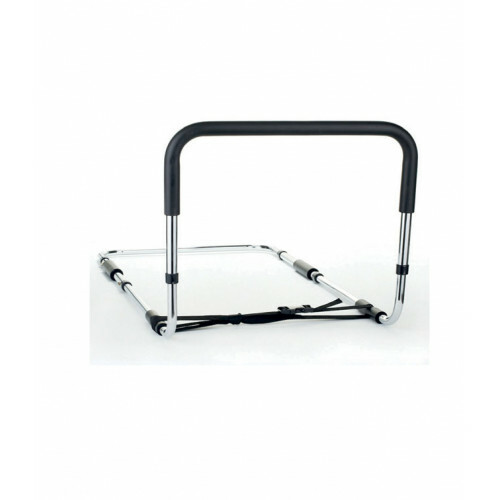 The powder coated steel handle clips into the frame with push buttons and can be removed when making the bed. No tools are required for Installation. 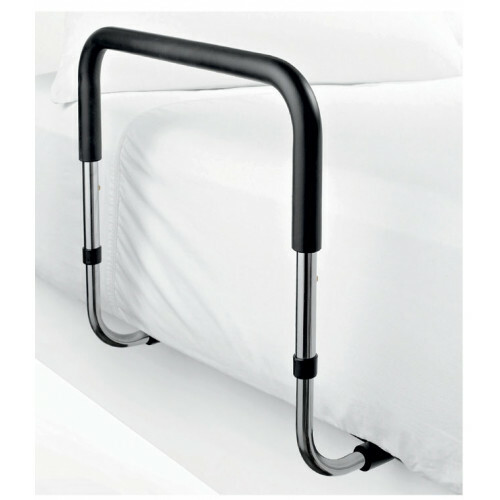 The bed asssist handle is designed for assistance for getting in and out of bed and can be used on either side of the bed. Bed Assist Handle simply slides under mattress with added feature of extra "no slip foam" on base bar. The handle is all steel, chrome plated, solid and easy to clean. Bed Assist is portable, easy to transport. Can be adjusted to flat position for easy storage.